A long time ago, in a far away place, I used to spend much less on groceries than I do these days. It was the golden years before the economic crisis, which brought the increase of oil prices. Which led to more expensive gas and thus, more expensive food. Every shopping trip I'd lament the rising price of groceries. The former every day low prices are the new sale prices. It's crazy. Yes, the golden days before expensive groceries, and before preteen boys who eat like a horse on a daily basis. They both have hollow legs. Regardless of appetites and the price of groceries, I still have to stick to a budget. And my budget is to feed my family of 6 on less than $400 a month. Which includes cleaning and school supplies and diapers. I remember reading an article 5 or 6 years ago about a newspaper reporter who decided to use only food stamps to buy food for her family of 4 for one month. She lamented how hard it was making those 550 dollars stretch. They even had to eat boxed mac and cheese and hot-dogs a few meals. I wondered what on earth she was buying. 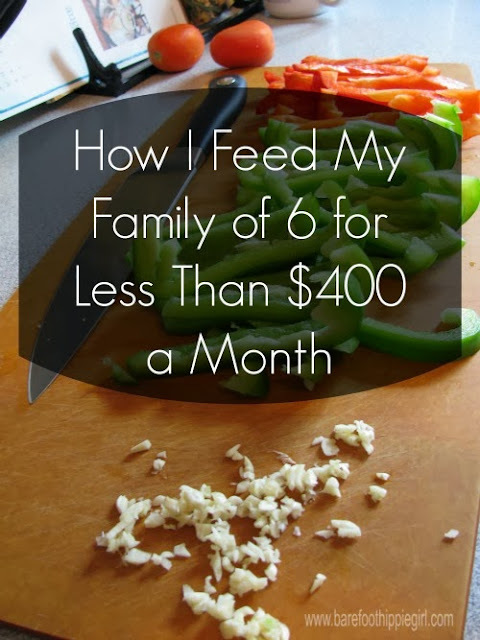 Because, back then, I fed my family of 4 on about $200 a month. We eat good! We eat lots of fruits and vegetables. We eat lots of variety. We eat meat most dinners. We practice hospitality weekly and I cook bulk for potlucks. So, how do I manage to make $400 stretch so far? -I cook from scratch. It is far more economical and healthier to buy ingredients not meals. I don’t buy any t.v. dinners. My most pre-prepared purchase is frozen ravioli. Imake my own bread. If I need pesto for a recipe, I make my own. For a pittance of the price of pre-made pesto, I can make anice sized batch that I can use for 2-3 meals, because it freezes well. -I buy in bulk. I have a chest freezer, so I am able to buy in bulk and freeze things. This includes sale items or bigger quantities. Most things, except for produce (lettuce, citrus fruits) are freezable. I have frozen milk. I do buy family size trays of meat, and divide into recipe portions. I buy 50 pound bags of flour and oatmeal. I save at least $.07 a pound on oatmeal, which adds up in the quantities we use. Yes, it is only $.07 a pound, but if I save $.07-$.10 a pound on each item, that really makes a difference. I was taught to not only think of the cents saved, but the percents. $.07 on a pound of oatmeal is over 10%. 10% of $200 is $20. Who hasn’t wished for an extra $20? -I buy and preserve fresh fruits and vegetables in season. Sometimes this isn’t actually cheaper than buying at the store, but at least I know what I have put into it. I can adjust sugar content based on my own fancies. Preserving your own food is definitely the healthier option. -I price compare, I don’t use coupons, and I shop at only 3 stores. I know there are people who swear by cutting coupons. That is not my thing. Nor is running around between 10 different stores every week. I firmly believe my time is as valuable as money. So, I have 3 stores I shop at-Sam’s Club, Aldi’s and Meijer. I price compare between the three each shopping trip. Sam’s and Aldi’s tend to stay fairly status quo, but Meijer runs sales, which will often make it the cheaper option. I know what I buy and the approximate price, and I keep an eye out for fluctuations. I rarely buy name brands-thestore brand is often the same product, bottled at the same location-with a different label. -I make a menu and always make a list. I give myself a budget, and mentally add up the price of my list before I go. I adjust my list/menu accordingly. A list limits my impulse purchases and saves me additional trips because I forgot a key ingredient. -I shop less frequently. I try to do a big shopping trip every other Monday.This saves me money and time. The actual trip takes just a smidge longer than if I was going every week, but really, one trip instead of two is saving me 2 hours every other week. That sums up my method for making my family delicious and healthy variety on a limited budget. What are you favorite tips?